No need to have an actual motorcycle to ride one. With a green screen, anything is possible. 1000 Words recently created motorcycle magic with the help of a green, well, blue screen. 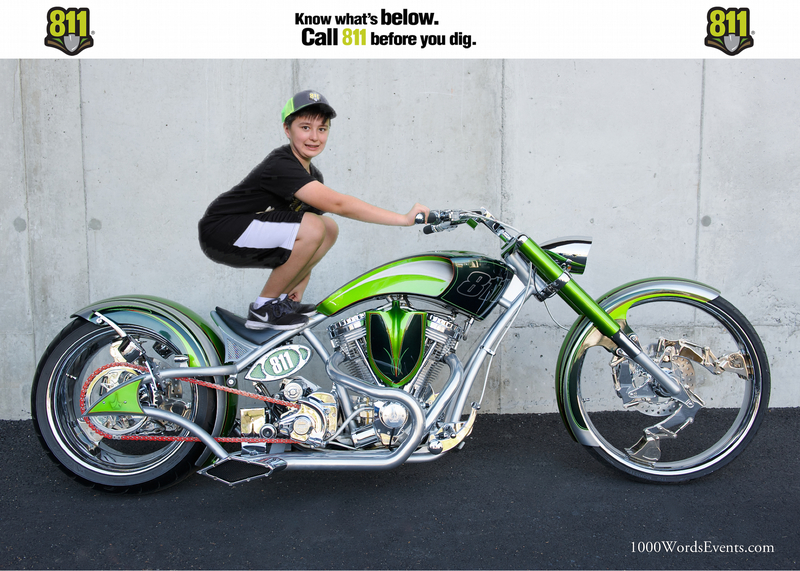 Our client Washington 811 asked us to photograph people on the One Call Concepts Bike, an epic motorcycle designed by Paul Junior Designs. The One Call 811 service alerts utilities of a digging project so that the area can be evaluated for gas lines and sewage pipes, avoiding hazards buried underground. 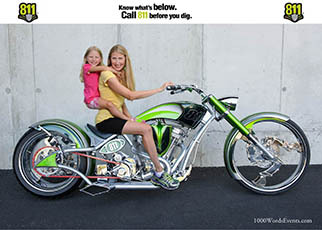 The beautiful bike was created just in time for National 811 Day on August 11th. So, our client wanted a photo booth with subjects sitting on the One Call Concepts Bike. Sounded simple enough, but there was a catch—guests could not actually sit on the $150,000 bike. That made things a little more interesting. We decided to photograph with the help of a Chroma blue screen, used instead of our green screen since the motorcycle is the same color. We were ready to ride! The day before the event, we photographed the bike against the blue screen and added a second image with Photoshop to complete the background. We set up at the Tacoma Rainiers game for the big day, where families, kids, and even Rainiers mascot Rhubarb could come strike a pose on a green screen stool that would become the motorcycle. It was a blast for all of us—definitely the most fun we’ve had with our green screen! Guests were amazed with how realistic the photos looked, and the final result turned out better than the client had hoped for. It really looked like everyone was riding the extraordinary bike! Want to let guests ride a bucking bronco at your next party? A vintage convertible? A ski lift? Whatever your event calls for, 1000 Words can make it happen with our green screen services!